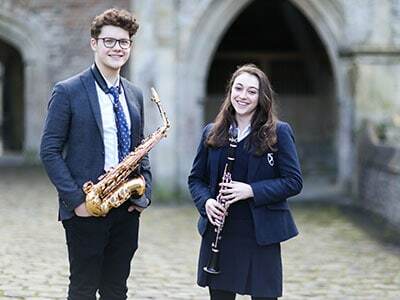 As we are so privileged to have such outstanding music provision and opportunities through our specialist music faculty, we are committed to sharing it with the local community and schools nationwide. 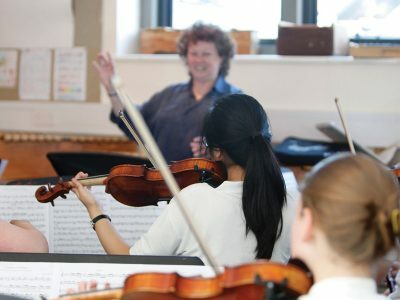 Through our extensive music outreach programme, individuals of all ages and school groups can benefit from our world-class teachers and facilities. If you have any questions about any of our outreach activities or wish to get involved, please contact our music outreach co-ordinator, Dominique Swain on 01749 834487 / [email protected]. Please see the links below or scroll down for details of some of our regular outreach opportunities. 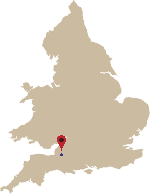 Wells Cathedral School hosts a whole range of musical activities and training opportunities for players and teachers from across the South West. 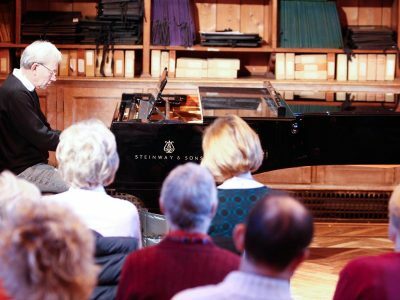 As a specialist music school, our renowned Instrument Skills Days are run by some of the leading professional musicians in their field. Open to students under 18 years of all musical abilities. Each day will finish with a concert performed in front of family and friends. with that atmosphere existing and knowing that we were in good hands, we could just enjoy making music. I enjoyed playing the natural trumpet the best – I also learnt lots about warming up and performance etiquette. I really loved playing the Harry Potter music! I developed my transposition skills and learnt how a professional musician plans their improvisation solos and interacts with other musicians. I also realised how the right facilities and staff would enhance my musical progress! I learnt a new way to remember my modes and communication whilst playing in a jazz trio/ quartet. It was really exciting to improvise for the first time in jazz playing! Please click here for more information and to book. The Piano Club is a friendly and encouraging place for mainly adult learners of any ability to share their experiences of playing the piano. 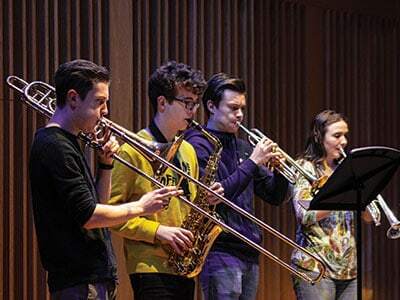 The sessions are informal, include refreshments, and are an opportunity to play to each other and discuss all things relating to playing the instrument at any level and any style. It is also an excellent way of making new friends. The club meets on Wednesday mornings once a month, in term time, in the grand surroundings of Quilter Hall at Wells Cathedral School. Participants are invited to arrive at 9.45am for a cup of coffee and sessions run from 10.00am – 12.00pm. As an adult learner I had always had lessons but had only played for myself and had never met anyone else who enjoyed piano playing for pleasure. It was very much a solitary exercise and I rarely finished any piece I was learning. For me, coming new into the area, Piano Club has meant joining a group of friends each month and music has become the centre of my life and has helped me to settle in a new place after spending 23 years in the north east. 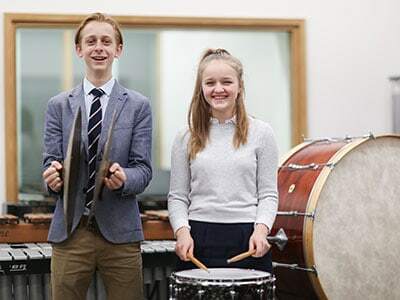 Wells Music College offers opportunities for anyone outside Wells Cathedral School to apply for one-to-one instrumental lessons with our world-class teachers. 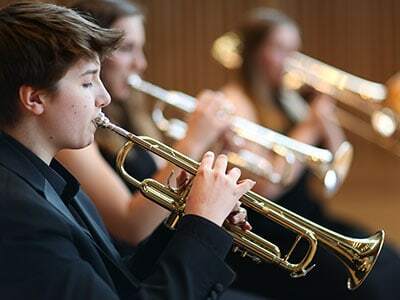 The full range of instrumental disciplines can be covered and often it is possible to extend and enrich the experience through access to some of the excellent ensembles in the school. 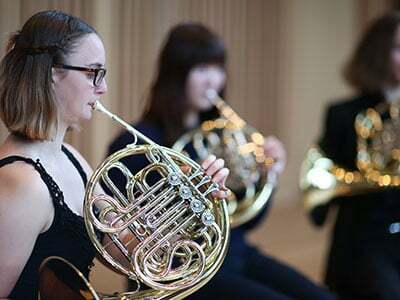 Click here for our Wells Music College Prospectus. If you would like to join the Wells Music College, please return this application form to Dominique Swain at [email protected] or post it to Wells Music Academy, Polydor, The Liberty, Wells Cathedral School, Wells, Somerset, BA5 2ST. For more information, please contact Dominique at [email protected] or 01749 834487. Every September, we invite all regional primary schools to participate in a Christmas Concert in December. Participating schools rehearse eight or more carols during the term and then join us for an exciting workshop with some of the Wells Cathedral School musicians in the magnificent surroundings of Wells Cathedral. 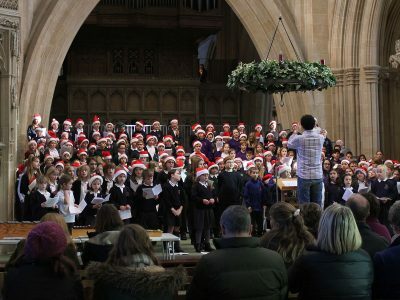 The event concludes in December with a lively evening concert in Wells Cathedral where parents and friends are invited to hear up to 250 children singing to celebrate Christmas. Magic! The Wells Young Musicians String Orchestra (WYMSO) is a string group for Grade 3 players aged 6-11. WYMSO meets most Saturdays in term time from 11.15am – 12.15pm in Quilter Hall at the Music School, Wells Cathedral School. WYMSO, under the experienced leadership of Catherine Lord, aims high and produces really good performances. There is always a positive and enthusiastic atmosphere with lots of laughter, and we always look forward to welcoming new players. Please contact Dominique Swain on 01749 834487 if you would like to give it a try as places are limited. If you would like to discuss any orchestra matters, feel free to contact Catherine on [email protected] or call 01749 834243. It is because of WYMSO that we decided to send our daughter to Wells Cathedral School. For me it has been the only forum available in our area for her to join in and play her violin to a high standard of expectation and discipline. The environment has always been very welcoming and very accepting of all abilities and she has always wanted to do her best for Miss Lord – something I aspire to emulate! She has also met lots of lovely children who, like her, actually want to enjoy playing well together in a beautiful environment. 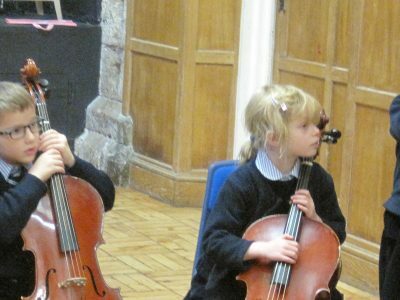 The concerts are always a glimpse for the children into possible future endeavours and overall it is a wonderful introduction to the world of musical performance and enjoyment that naturally spills over into lots of other areas of a child’s life. I can’t praise Miss Lord highly enough for her positive influence and encouragement of my daughter. If only more people would allow children to believe that with hard work, they can achieve…. Workshops in our community and concerts in schools and nursing homes form part of our annual programme. 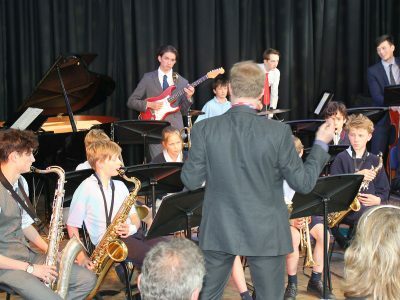 A variety of our musical ensembles pay visits to schools to assist in workshops tailored to the needs of the school. 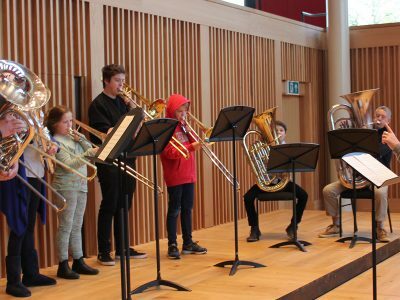 Recently, visits have been made by a string quartet, a brass quintet and a jazz combo where the musicians have accompanied the school orchestra or jazz group and then performed a concert to parents. Furthermore, groups of students create a 30 minute show to introduce their instruments and the orchestra to local primary schools. The children remain captivated by the music and the players and are much amused by such a humorous and engaging production. Requests from schools, charitable events and nursing homes are always welcomed on the understanding that we may not always be able to fulfil all the requests. Please contact Dominique Swain on 01749 834487 / [email protected] if you’d like your group to be considered. Song Squad is open to boys and girls in years 3-6 who want to sing, have fun and make new friends. Participants learn to sing to a high standard with regular performances. 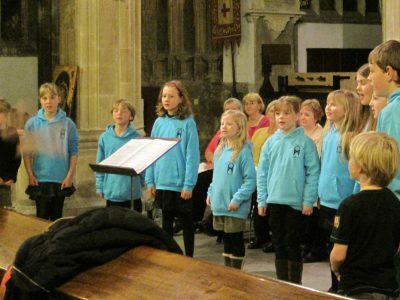 Rehearsals, run by Tricia Rees-Jones, take place during term time on Tuesdays from 5.00pm to 6.00pm in the education room at Wells Cathedral. If your child is interested in joining Song Squad, please call Tricia on 01749 330160 or email [email protected] with your name, the child’s name, date of birth, telephone number, school and home address.